This now works. 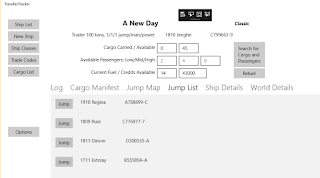 You jump and it will add a week to your ship's date, create a log record indicating the jump taken, subtract out the fuel required, and debark all your passengers. I've added a couple more fields to a couple of tables to handle this. I will also need to refresh the screen, or use the whole IObservable thing so that the screen layout updates automatically.